Things you can’t miss in Cromwell! Whether you’re passing through the Central Otago town of Cromwell on your way to Queenstown or staying here for the huge picking season opportunities as a seasonal worker, don’t miss these awesome things to do in Cromwell! While there are quite a few things to do in Cromwell, as we list in our 10 Damn Good Things to Do in Cromwell, we’ve narrowed down this list of offerings to just 5 Cromwell must-dos! 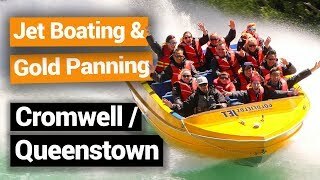 Cromwell, on the shores of the man-made Lake Dunstan, is famous for its wine-making, cycle trails, hikes, golf course, jet boat rides and even a motorsport park. 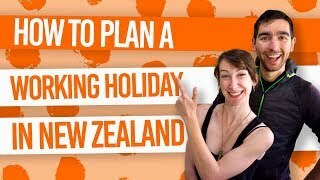 There’s so much to do that you’ll definitely want to stay awhile, so check out these 5 Best Backpacker Hostels in Cromwell for an affordable place to stay. If you have a need for speed, because who doesn’t? 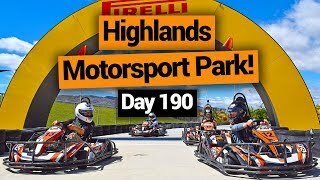 !, then get yourself to the Highland Motorsport Park! Not only can you challenge your mates on the go-karting track, you can experience the thrills of a supercar on the Highlands international standard race track. For any motor-head experience, they are bound to do it at Highlands so it’s definitely worth checking out! Just 5-10 minutes out of Cromwell is the Goldfields Mining Centre. It’s the perfect place to learn about the gold rush of the Central Otago region that was experienced in the 1860s, keving behind many fascinating machinery and buildings. Discover this and even prospect for gold yourself at the Goldfields Mining Centre, with guided tours, self-guided walks, a jet boat ride and even a restaurant. Cromwell is in the heart of the Otago wine-making region with a few outstanding wineries of its own. Check out Misha’s Vineyard Tasting Room, Mt Difficulty Wines, Wooing Tree Vineyard and Carrick Winery for some wine tasting and tasty platters. On any must-do list, we like to add a free must-do activity! For Cromwell, it has to be the Old Resevoir Track which zigzags up to an old reservoir site to reveal awesome views of Cromwell, Lake Dunstan and the surrounding mountains. The track takes 30 minutes to go uphill and much faster to finish on the way down. For more short walks, check out our things to do in Cromwell list. Location: 3km from the Deadmans Point Bridge over Lake Dunstan. 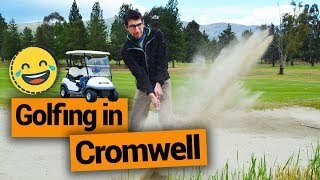 The majority of Cromwell seems to be taken over by the Cromwell Golf Club so embrace that fact and get onto the green. Golfing is New Zealand’s most popular sport! (By that, we mean it’s the sport with the highest participation rate). So embrace the Kiwi culture and hire yourself a set of clubs. Choose from 9 holes or 18 holes and enjoy a relaxing and affordable activity surrounded by those Cromwell mountain scenery.